Can’t draw a straight line? GOOD! This workshop is for you. If you can sign your name, you can draw. Join award-winning artist Barbara Neibart in a workshop designed for everyone, at every level. 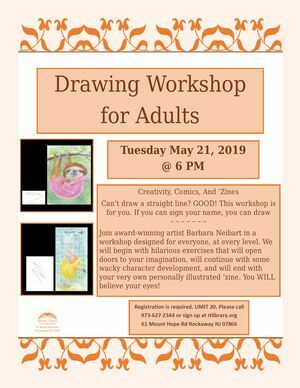 We will begin with hilarious exercises that will open doors to your imagination, will continue with some wacky character development, and will end with your very own personally illustrated ‘zine. Registration is required. Limited to 20 people!